Tricked-out motorcycles are designed to get gearheads' pulses pounding with their sculpted shapes and exposed high-performance motors. By contrast, Joey Ruiter sought to strip the motorcycle of all its trappings - opting instead for a minimalist mirrored body that practically vanishes from sight as it passes through the streets. His bare-bones Moto Undone bike defies the aesthetic of two wheeled transportation while using the latest electric motor technology. 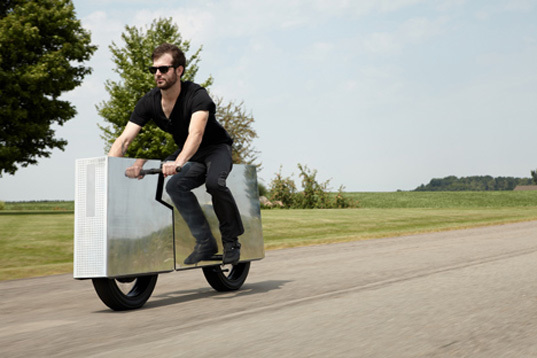 Ruiter has shaken up conventional transportation in the past – he’s also know for his his “super minimal city bike”, which reduces material use to the bare minimum. For Moto Undone, Ruiter completely covered a motorcycle’s eye-catching features and exposed mechanics with an aluminum casing. The vehicle is stripped of all ornamentation and it’s not even painted, leaving raw material as the main focal point. By “ignoring what makes motorcycles interesting,” Ruiter designed the opposite of the flashy paint and weaving pipes of typical motorcycles. At a glance, the rider is the only thing fellow drivers can see, as the reflective aluminum makes the bike nearly invisible while passing along the landscape. The aluminum also covers a 1000 watt 48v electric motor that can run for 90 miles, or about 3 hours. The (questionable safe) bike doesn’t have any information dials, so all the information including speed and GPS tracking can be displayed on a smartphone with various apps. Joey Ruiter will display Moto Undone and other designs at the Grand Rapids Art Museum in Michigan from September 21st to October 8th. helmet? it's a photo shoot people. safety? it's a motorcycle. lights? i could be wrong but i looks like there are a series of holes in the front. maybe there is a light behind that. obviously more conceptual than something going into production. i think it's beautiful and i want one to match my airstream! its the helmet invisible too?? ditto for other comments here AND turn signals? headlights? 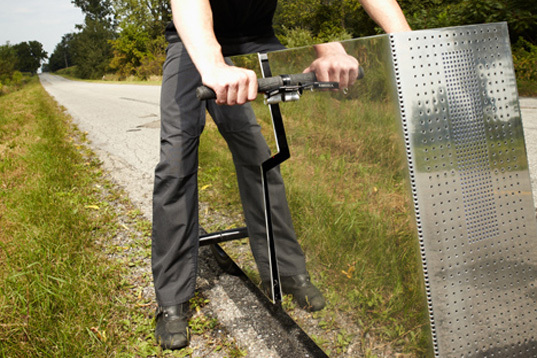 what about the poor sap at Yamaha trying to make bikes safer? what size bread do you put into that? What's the carbon footprint of dealing with a Traumatic Head Injury? Exactly. Beautiful, but aesthetics should never do more than compete with utility--and here they demolish utility in the worst possible way: that of safety. This would reflect glare from other vehicles, street lights, and the sun, blinding other motorists and even the driver herself. That's the mild part. Another vehicle would see a reflection that would range from confusing to outright misleading. At minimum we are looking at a disorientating view: Another vehicle would receive an oddly-spliced view with the additional problem of concealing the motorcycle. It's easy to imagine an obverse vehicle (with the motorcycle stationary at, say, an intersection) believing another vehicle is speeding towards them head-on (their own reflection) and they veer off violently. Then there's the air-drag (in an 'efficient' vehicle, no less), the lack of ergonomics and the hot/slick/cold surface. This is for art not engineering. Riding that thing looks about as safe as eating lead paint. He's not even wearing a helmet and not one of the pictures shows him making a turn. I call "shenanigans"! Ruiter has shaken up conventional transportation in the past - he's also know for his his "super minimal city bike", which reduces material use to the bare minimum. For Moto Undone, Ruiter completely covered a motorcycle's eye-catching features and exposed mechanics with an aluminum casing. The vehicle is stripped of all ornamentation and it's not even painted, leaving raw material as the main focal point. By "ignoring what makes motorcycles interesting," Ruiter designed the opposite of the flashy paint and weaving pipes of typical motorcycles. At a glance, the rider is the only thing fellow drivers can see, as the reflective aluminum makes the bike nearly invisible while passing along the landscape. The aluminum also covers a 1000 watt 48v electric motor that can run for 90 miles, or about 3 hours. The bike doesn't have any information dials, so all the information including speed and GPS tracking can be displayed on a smartphone with various apps.